Amanda Owen, better known as The Yorkshire Shepherdess, shares her delicious recipe for a roasted leg of mutton. ‘Mutton? !’ I hear you cry . . . Nobody eats mutton; it’s old, chewy and, frankly, why would you want to when you can eat lamb? Well for me it beats lamb hands-down every time and for a number of reasons. Firstly, the joint is larger and can feed more people, secondly, it’s more affordable and has more taste and, last but not least, I feel that I can eat it with a clearer conscience knowing that the animal had a longer life and had time to mature. Of course I am a little biased here as we produce our own home-reared animals, so we 100 per cent know their provenance. Mutton certainly tastes better with the assurance that the sheep had freedom to roam and graze naturally. Now, when it comes to cooking I am no domestic goddess; I haven’t got the time to mess about. I want something that tastes great but doesn’t need unusual ingredients that I won’t already have in the dairy, and if you have a splendidly sizeable joint of meat in front of you why would you want to mess with it too much anyway? Some things are better just left alone. Breadcrumbs - made from three slices of any old bread, not mouldy but stale is best, chucked into a food processor, nothing fancy required. Parsley, mint and rosemary - fresh is great but dried will suffice. Quantity wise, go with what you like. 2 Knorr Lamb Stock Cubes - No, I’m not sponsored by them but I use them and know that they work! Red wine - just a couple of glasses but not it’s not essential, don’t crack open a bottle specially. 1. Put your oven on a very low setting (150° C, gas mark 2). 2. In a bowl, mix the breadcrumbs, pepper and herbs together with the olive oil. 3. Place the onions in a roasting dish and sit the mutton on top of them (they act as a trivet). 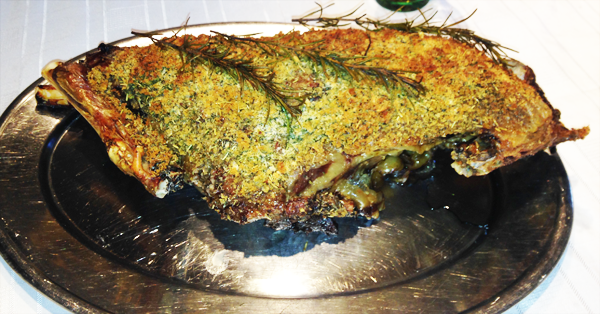 Brush the mutton with melted butter then press the herby breadcrumb mixture on top. It won’t all stick perfectly, but it doesn’t matter if some drops into the dish – it will add flavour to the resulting gravy. 3. Dissolve the stock cubes in a little boiling water and then top up to a pint by adding cold water. Pour into the roasting tray. Cover tightly with foil. I always put a piece of baking parchment under the foil to prevent the crust from getting stuck, but alternatively you could grease the foil with a little bit of butter or oil. 4. Put the joint in the oven and go and do something else for a very long time. Depending on the size of your joint, it could be four to five hours. Allow approximately 40 minutes per 450g. Uncover the meat for the last half hour of cooking. 5. When it is cooked, remove the joint from the roasting dish and put it aside to rest for about twenty minutes. Make the gravy by adding boiling water (or wine) to the onions and leftover juices in the dish, deglazing it. Then pour the liquid, onions and bits of herby crust that dropped off during roasting through a small sieve, saving the strained liquid in a bowl underneath. 6. To thicken your gravy, mix some plain flour or cornflour to a paste with cold water and add carefully in small amounts, making sure it all dissolves. Keep tasting the gravy – is it too strong, too watery? Once the gravy has thickened, you can reheat it. 7. The crux of this whole recipe is patience and having the confidence to just go with your taste buds. I am very guilty of just making it up as I go along and using up leftovers from the fridge. Chuck in some garlic or a few root vegetables along the way . . . whatever you fancy. 8. Serve with mint sauce, redcurrant sauce or rowan jelly, roasted potatoes and Yorkshire puddings. 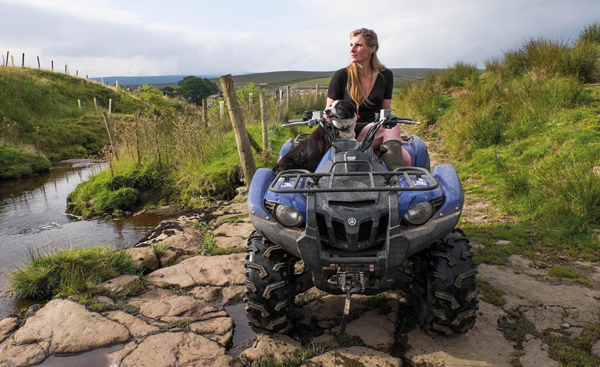 A Year in the Life of the Yorkshire Shepherdess, which follows the adventures of Amanda Owenas she juggles farming life with the demands of family on her remote Yorkshire farm, is out now.